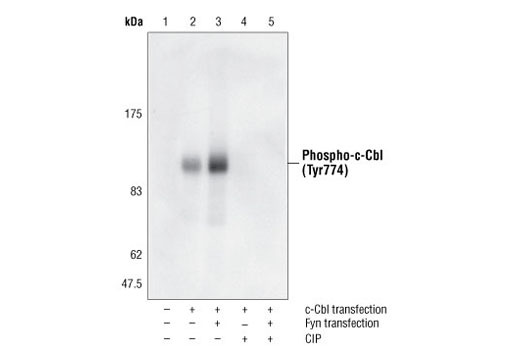 Phospho-c-Cbl (Tyr774) Antibody detects endogenous levels of c-Cbl only when phosphorylated at tyrosine 774. The antibody does not cross-react with related tyrosine-phosphorylated proteins. Polyclonal antibodies are produced by immunizing animals with a synthetic phosphopeptide corresponding to residues surrounding Tyr774 of human c-Cbl. Antibodies are purified by protein A and peptide affinity chromatography. The c-Cbl proto-oncogene is a ubiquitously expressed cytoplasmic adaptor protein that is especially predominant in hematopoietic cells (1,2). c-Cbl is rapidly tyrosine-phosphorylated in response to stimulation of a variety of cell-surface receptors and becomes associated with a number of intracellular signaling molecules such as protein tyrosine kinases, phosphatidylinositol-3 kinase, Crk, and 14-3-3 proteins (3,4). c-Cbl possesses a highly conserved amino-terminal phosphotyrosine binding domain (TKB) and a C3HC4 RING finger motif. The TKB recognizes phosphorylated tyrosines on activated receptor tyrosine kinases (RTKs) as well as other nonreceptor tyrosine kinases. The RING finger motif recruits ubiquitin-conjugating enzymes. These two domains are primarily responsible for the ubiquitin ligase activity of c-Cbl and downregulation of RTKs (3). Research studies have indicated that in human cancer tissues, c-Cbl is frequently tyrosine-phosphorylated in a tumor-specific manner (5). Phosphorylation of Tyr731 of c-Cbl provides a docking site for downstream signaling components such as p85 and Fyn (6). Blake, T.J. et al. (1991) Oncogene 6, 653-657. Thien, C.B. and Langdon, W.Y. (1998) Immunol. Cell Biol. 76, 473-482. Christine, B.F. et al. (2001) Nat. Rev. Mol. Cell Biol. 2, 294-307. Feshchenko, E.A. et al. (1998) J. Biol. Chem. 273, 8323-8331. Kamei, T. et al. (2000) Int. J. Oncol. 17, 335-339. Hunter, C. et al. (1999) J. Biol. Chem. 274, 2097-2106.